There is a seismic shift underway in the employer/employee relationship that is redefining the nature of jobs and careers.Sole proprietors and independent contractors now represent more than 20 percent of the workforce, and that number is expected to reach nearly 50 percent within the next 10 years. Despite the proliferation of people engaging in freelance and contract work, however, the path to success is not always easy. 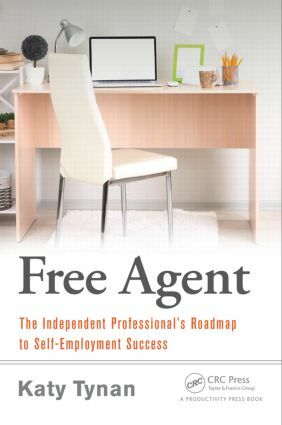 Free Agent: The Independent Professional's Roadmap to Self-Employment Success details a pragmatic action plan to help you succeed in this new skills marketplace. 1. What Business Are You In? 2. Who Do You Work With? 3. How Will Your Business Income Impact Your Taxes? 4. How Does the Business Structure Itself Protect You from Liability? Katy Tynan is a free agent. Working where people and technology come together, she provides strategy and operational guidance to high-growth organizations. Katy is currently engaged in a variety of activities including consulting, writing, and speaking. She is passionate about how the world of work is changing, and how individuals, businesses, and educational institutions need to adapt to the evolving landscape of flexible work. Prior to her transition to being a full-time independent professional, Katy was part of the leadership teams of several successful startups including Thrive Networks (acquired by Staples) and Winphoria Networks (acquired by Motorola). When she is not helping solve business and technology problems, Katy can be found traveling, kayaking, sailing, or reading. Katy, her son, and her dog live near Boston, Massachusetts, and she is a proud graduate of UMass Amherst.